Despite a currently minor retrace in the wider markets, the overall smallcap oil and gas sector remains fairly strong and on an increasingly encouraging path of recovery. Fastnet Oil & Gas (LSE:FAST) is one company that remains out of favour with investors, trading currently at 5.03p - just above major support at 5p/share. However, despite the lack of market interest, the asset base and strategy remain compelling, and I have little hesitation in doubling up the portfolio stake, taking the average price down to 5.325p. Having questioned new Chief Financial Officer, Will Holland (WH), the upside picture for Fastnet has become much clearer, and it is now far more easily to attribute value to Tendrara Lakbir - an asset that I previously had concerns with. With well over half the current £17.35m market cap covered by cash, and an attractive portfolio of assets, Fastnet (ceteris paribus) will likely find favour with investors during the rest of the year. 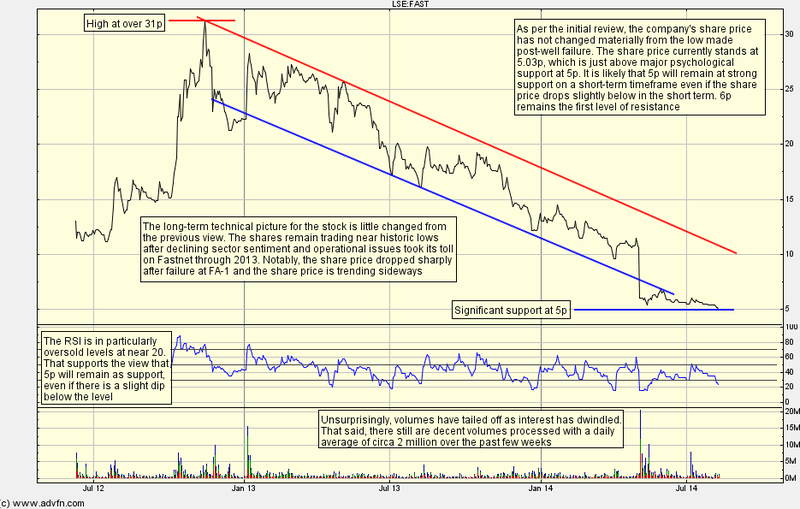 As per the initial review, the stock remains in a long-term downtrend, although it currently lies just above key 5p support. With cash balances covering far over 50% of the market cap (and around 70% as at the end of May), it is highly likely that a low will be cemented around current levels at which point, a trend change can occur. The current ask price for Fastnet is only very slightly higher than the mid at 5.05p, which indicates a slight overhang (most likely from Standard Life). Pensions fund stakes in small oil and gas stocks can be dismissed though - they are often just 'punts' and they are not a good indicator. However, that presents an interesting opportunity at current levels, with refreshed fundamentals underscoring attractive upside. As I strongly pointed towards in the initial review, management are very much aligned with shareholders and WH was also keen to point that out. With oil and gas companies, either the assets have to be excellent, or the management has to be excellent - in Fastnet's case, both boxes appear to be ticked. "When I was investing at Macquarie I always looked for how much skin management had in the company. This shows true alignment with shareholders and I was very comfortable that Cathal, Paul and Carol have significant amounts of their personal wealth in the company. Ultimately I joined to make money and I have an option package that will be very valuable to me if we can execute on our strategy. It’s not a lifestyle company and the management team are not looking at Fastnet as a job for life, it’s a vehicle to make money for shareholders." Clearly, as an investor, you have to doubt the commitment to shareholders when the share price has slumped considerably since the start of 2013. However, that market has been far too harsh on the company's activities. For example, the failure of the Foum Assaka-1 well earlier in 2014 saw the share price slump 50%. That was despite an incredibly well managed farmout that saw Fastnet almost entirely carried for the well, and Fastnet secure even more lucrative terms with Korean giant SK Group than even Kosmos achieved with BP. It put Fastnet on a solid financial footing, with a large portion of the market cap secured in cash - the remaining impact of that can be seen on the balance sheet with circa $22m in cash at the end of May along with minimal operational cash burn of £110k/month. That is testament to the credibility of the management, and in that respect they have already proved their capabilities. With many oil and gas juniors such as Sound Oil (LSE:SOU), Kea Petroleum (LSE:KEA) and Rose Petroleum (LSE:ROSE) all kicking into life over the start of 2014, it can be seen that investor appetite for oil and gas juniors is growing. That is likely to have a snowball effect as success with these companies can lead to investors pushing cash towards other companies. There are however a few key points to consider, that affect how well they perform. First and foremost, these companies had upcoming catalysts. Sound had gas production being brought onstream, Kea had the drilling of a well, and Rose's share price increased ahead of a drilling campaign and after a positive economic assessment. Importantly, Fastnet has equally high impact catalysts during the rest of the year, that would be equally capable of generating upside. The second point relates to cash. Sound benefited from a large institutional investment at a premium to the share price, that washed away any funding concerns. Kea has a less secure cash situation although it had agreed convertible loans with Darwin and had signed a farmout to carry it through a high-impact work phase. Rose was able to place a significant amount of shares at a decent share price, and allowed for the upside case to be pushed forward. Fastnet tops each of those, with a cash balance that makes up circa 65-70% of the market cap. That means that the shares are trading at a circa 33% premium to the cash balance, which is undoubtedly one of the smallest premiums in the sector. Admittedly, there are a couple of anomalies such as Global Petroleum (LSE:GBP), but GBP will require a large amount of cash to continue their operations, and the management has not covered itself in a positive light with regards to strategy - the asset base is unproven. On the other end of the spectrum, Rose is trading at a 500%+ premium to its cash balance with Kea trading at a premium of well over 1000%. Of course, the premium should narrow when cash balances are larger, but in Fastnet's case, it proves that the market is factoring in very little, for what is essentially a very interesting basket of assets. The low cash premium is usually either as a result of impending high cash burn or a weak asset base. As above, that fairly obviously does not apply to Fastnet. To recap briefly, Fastnet retains a small net interest in the Foum Assaka block offshore Morocco, a large package of licences in the Celtic Sea, south of Ireland, and an option for a large block onshore Morocco, that has an existing discovery. Adding some background, the operating environments are particularly attractive. Morocco imports nearly all the oil and gas that it consumes and there is a buoyant market within the phosphate industry alone, albeit there is potential to pipe any discovered gas at Tendrara into Europe. Nonetheless, the Moroccan gas royalty is just 5% with oil capped at 10%, plus there is a 10-year corporate tax holiday on any discovery. Offshore Ireland, Fastnet's acreage has also become more enticing after Ireland passed an increased marginal tax rate for production from 40% to 55%. Starting with offshore Morocco, much has been made of a string of unsuccessful wells over the Western offshore area of Morocco across a series of geological settings. The most recent of those was made by Galp and Tangiers Petroleum (LSE:TPET) after reporting a dry well, and their efforts were not aided by a poor financial situation, which led to their share price collapsing in dramatic style. However, what has to be remembered is that Fastnet is partnered with industry majors - Kosmos, BP and SK and that their area of operation remains largely untested for a wildcat region. Fastnet is carried for the next well too, so there will not be any material cash outlay, so there is great upside with theoretically little downside. Refreshed drill plans for the asset will likely be released in 2015 and point towards a follow-up well during 2015/2016 - a catalyst in its own right. After all, the FA-1 well confirmed a working hydrocarbon system and derisked all aspects except for reservoir thickness and quality. Genel Energy, who operate an adjacent block, recently set to work on drilling well SM-1 in the Sidi Moussa block. With 60 - 90 days to drill, results from that well will be forthcoming during H2. Recall that Longreach O&G made a discovery at their Kamar-1 well earlier in the year, and combined with their Koba-1 well it showed that the entire structure was "gas filled". Furthermore, although further up North, Australian major Woodside Petroleum's recent entry into Chariot Oil & Gas' offshore blocks show that appetite for Moroccan offshore exploration has not faded. These terms give the company much more flexibility both financially and with respect to timescales and it now looks very likely that the company will exercise their option. The first step before that is for the company to seek a farmout partner to try and assist in a drilling program across the block to potentially access as much as 892bcf (high estimate, unrisked). MD Paul Griffiths commented, "The revised terms significantly reduce Fastnet's financial exposure and provide us with much improved project economics. The process of bringing in an additional partner is underway. We expect that the new commercial terms and project economics should allow us to attract a major partner, with experience in developing and monetising onshore gas discoveries, by offering sufficient equity, whilst maintaining a material equity level for Fastnet shareholders as we seek to target materially higher potential gas resources in the planned drilling programme. We maintain our strategy of prudently managing our cash resources as we did through our successful Foum Assaka farm-out, which de-risked our financial exposure to the drilling costs. We believe that the Tendrara Licence is highly attractive to a potential strategic gas partner given the existing TE-5 gas discovery with near term development potential, and the additional prospectivity of multiple play types within the large licence area which provides significant potential upside." Looking further at the existing discovery, WH comments upon a range of simple techniques that can be applied in order to access commercial rates from the existing discovery. With an estimated chance of success (COS) in the order of 70%, the drill is highly likely to find favour with investors, as it is one of the highest level estimated COS' being drilled in undeveloped regions. "The mud weights were too high, which resulted in near wellbore damage and a skin of +30 and the frac job that was performed was too small and ineffectual. In addition only 50% of the net pay was perforated so a large part of the reservoir was not tested. When the well was tested the wellbore fluids were not displaced from the completion so a liquid column was left in the well during the test. This column resulted in hydrostatic pressure being applied to the reservoir so the pressure differential across the perforations was lower than it could have been which effectively acted as a choke on the well." It was then pointed out that a flow rate of 5+mmscfd would be possible had the above techniques been implemented properly. The discovery and high size of net gas pay provide the company with a low risk and attractive asset to exploit, with major upside potential across the rest of the block. Furthermore, the resources would still be economically viable if the flow rate is just 3mmscfd at P50 volumes. Once again, this gives investors an opportunity to access a low risk gas development, with very impressive upside figures. Following the incorporation of data from the nearby Meskala gas field, the potential of delivery from the reservoir has been confirmed as Meskala's gas reservoir has been operating for almost thirty years. "Tendrara is the most tangible asset in the portfolio. It is significant gas discovery on the doorstep of Europe in a gas hungry market. The asset valuation is robust and there is a clear route to monetisation. The 3D seismic data have been reprocessed and PRE-Stack Depth migrations have been generated for the first time. This data have greatly improved reservoir continuity and have increased the area around the TE-5 gas discovery that lacks fault compartmentalisation – thereby increasing the connected volume and potentially decreasing the number of development wells required. New Petrophysics for the TE-1 well, 400 meters downdip from TE-1, have confirmed logged gas in the same reservoir as TE-5. TE-1 was drilled in 1966 and was initially thought to be in a different structure. The new 3D processing has indicated that it appears now to be in communication with TE-5, which potentially will increase the GIIP upside Case still further." 2 wells are expected to be required to prove both Tendrara's commercial potential and to firm up gas volumes. The high chance of success greatly derisks the asset. The strategy for Fastnet will be to prove up that commercial rates can be derived, and then follow the exit strategy that has talked about for the other assets. That would involve monetising the commercial part of the block and carving out the rest as an exploration area, which Fastnet would keep a stake in. The block is extensive so there is considerable potential across the block as a whole, aside from the discovered aspect. For example, there is the undrilled TAGI structure, along with conventional and unconventional (shale) potential within the Palaeozoic zone - an underexplored zone compared to Algeria, an adjacent country. The upside potential from Tendrara is now a lot clearer and gives the company a lower risk element that I would now agree has not been fully appreciated by the market. Whilst some investors will still await the exercising of the option before factoring in the asset, it is highly likely to be exercised, so the upside should probably be factored in now. An existing find, with simple techniques to confirm commerciality, enticing gas pricing, and a high chance of success, Tendrara carries significant upside in itself and now extends the timeframe during which I would be happy to hold Fastnet shares - holding through the low risk drill looks increasingly appealing given the large quantities of gas involved. As before, the final asset are the large positions held in the Celtic Sea, next to Charge Oil's blocks and close to Providence Resources'. Much concern has been bandied around regarding Providence's difficulties that have been encountered in farming down the Barryroe discovery - a discovery deemed to be highly significant to the Irish oil and gas industry, but whose farmout progress has left much to be desired. However, I have been an advocate that Fastnet's acreage is at least as attractive on a 'value' basis when looking from an 'arms length' viewpoint. That can be explained. 3D seismic has been shot over the Deep Kinsale and two Mizzen licences by Fastnet and that has assisted in derisking the acreage, plus yielding some direct hydrocarbon indicators. Looking back at historic records, well 48/25-1 was drilled in 1972 in deep Kinsale - a well that located oil in the early cretaceous Upper Purbeck level, established that reservoirs there were much better developed than at Barryroe, and supported the view that the Base Wealden Barryroe oil sands are regionally extensive. In addition, as noted in various company presentations, compartmentalisation has not been seen in the 3D and that suggests that hydrocarbons are connected meaning fewer development wells to exploit any discovery and lower overall development costs versus Barryroe where compartmentalisation is a stated concern. "The key finding of the study is the Seven Heads reservoir is significantly more compartmentalised than had been anticipated and the production wells are connected to a smaller volume of gas bearing rock than had been expected. . .The original interpretation of the Seven Heads gas accumulation was a structure completely filled to the 'spill point'. . .New pressure data. . . has illustrated subtle pressure differences between some of the sands. This demonstrates the sands are isolated from one another." As per the first review, prospective gas and oil volumes for the licences are incredibly large, and have the potential to host billions of barrels of oil or multiple TCF of gas. Along with seemingly superior geological characteristics and analogous discoveries offshore Eastern Canada, the block is likely to appeal to large players. WH noted, "With the scale of asset, politically and fiscally stable environment, access to markets, and amount of equity available, our acreage is attracting significant interest from the majors." I reckon that there is a final point that is equally important, aside from geology. That is the commercial terms that Fastnet are seeking. Fastnet are seeking a contribution of up to $22m in back costs, which is little outlay for a major company. Nevertheless, it would further bolster Fastnet's balance sheet and give them a financial position that could significantly exceed the current market capitalisation alone. The strategy remains to complete a secondary farmout down the line before drilling in 2016, so the farmout remains the upcoming catalyst for the asset. Why is the low cash contribution key? Barryroe may present an attractive asset, but the geological risks mean that any farmout will be signing up to large CAPEX when the asset may not have been sufficiently derisked for their liking. That partly explains the drift in both Providence's and Landsdowne's share prices. Of course, there will come a point where risk < reward, and their asset still carries a large amount of intrinsic value, but the earlier expectations could be far off the mark. Even so, any farmout at that asset would be a positive for Fastnet - what is clear is that Fastnet's acreage position should not be frowned upon in relation to Barryroe. The acreage is highly prospective and is a low cost entry for a major, especially since they could even complete a second stage farmout themselves (as per offshore Morocco and Kosmos). All prospects and geological objectives are in or next to working petroleum systems. "The cash value [at end May 2014 is 3.8p] and the implied carry value of the next FA well is 2p therefore investing at this price a shareholder would get Tendrara and the Celtic sea for free. Tendrara on a risked basis for the P50 volumes is worth 21p and the Celtic Sea 15p. Completing a farmout on either of the assets will result in a re-rating of the stock and the drilling on Tendrara could prove up to 900bcf of gross gas, the value of that would be +90p/share. Tendrara is not exploration drilling so the risk is significantly lower, the gas is there and the risk is around proving commercial rates. Management believe that this risk is in the region of 70% COS.
Fastnet has sufficient cash on the balance sheet to fund itself well into 2016 and beyond on current cash burn rates and current licence obligations. Fastnet has a large material portfolio of exploration and appraisal prospects in favourable fiscal regimes; stable political environments; and integrated with and adjacent to European infrastructure and markets. Development projects are likely to involve much lower CAPEX expenditure for the majors who may farm in compared to many of their deep water projects which are under pressure from cost exposure and timing to positive cash flow. Fastnet has completed their expenditure on maturing our asset portfolio to drill-ready status. This puts us in a small peer-group of AIM companies that are very well positioned and financed to take advantage of the change in industry emphasis and the inevitable upswing in the oil and gas sector cycle as soon as it occurs. Fossil fuel is a finite resource and supply and demand pressures will continue to occur particularly as a consequence of political upheaval in Syria, Libya and Iraq and as a consequence of the new relationship between Europe and Africa." From my perspective, the upside case remains obvious, and I upgrade it upon further information on Tendrara Lakbir. 2014 news events include Tendrara and Celtic Sea farmouts, that with management's credibility, could well see large names be brought in alongside Fastnet. The depressed share price remains the result of previously weak sector appetite combined with an unsuccessful drill offshore Morocco - the actual asset base remains intact and upside remains very compelling. The cash balance as it stands provides excellent backing to the share price, and if the Irish farmout is completed during H2, it could more than cover the current market cap, with up to £23m in cash at calendar year-end. The importance of management cannot be understated, and the presence of Paul Griffiths, Carol Law, Cathal Friel and now Will Holland, now set the company up soundly. Their incentives are aligned with that of shareholders, and 5p support is likely to hold firm, providing a platform to build off. Gross best estimates across all structures in the portfolio are estimated to contain over 22 billion barrels of oil and over 8 TCF (mainly in Ireland, so remains prospective), but the TE-5 Lakbir structure alone carries 311bcf in the best case, with separate onshore prospects/leads of 1.4TCF. The strategy embarked upon looks sensible, and has been executed well to date offshore Morocco. Carol Law recently bought £60,000 worth of stock at near to 6p - whilst recognising that Fastnet is obviously not profitable and operates in a high-risk sector, I have little hesitation in doubling up the current stake to a full slot at an average of 5.33p. Investors have a newfound appetite for high COS drilling, whilst the Celtic Sea and Moroccan assets present high-risk high-reward exploration exposure. Both the asset base and strategy look very compelling, and the market is likely to awaken as the strategy is executed. I retain my Buy tag on Fastnet. A compelling case for investment in this Company. Many thanks for suggesting another top quality opportunity. another great review and must say I have increased my portfolio value due to your reviews. I have been in since the begining and would concur with the above. The most important event in the future is that the two farm downs, Tendrara and Celtic Sea, happen in the near future. The delay in the Foum Assaka farm down,although it was a good one, was the cause of the first major price drop. What are your thoughts now? Tendrara Lakbir - will that be sold on?